Malignant gliomas including GBM are extremely rare in children as compared to the adult population, comprising only 5-10% of all childhood intracranial neoplasms. Giant cell glioblastoma (GCG) is a rare subgroup of GBM, which constitutes around 5% of all GBMs. It is characterized by the presence of abundant bizarre, multinucleated giant cells along with abundant reticulin stroma and high frequency of p53 mutations. GCG more commonly involve the supratentorial cerebral hemisphere and portends a better prognosis than the conventional GBM. Out of 70 cases of pediatric glioblastomas operated at our center from 2002-2009, there were two cases of pediatric GCG (3%). A 10-year-old girl presented with history of two episodes of focal seizures with secondary generalization in the last 6 months and with recent onset headache and vomiting from last 10 days. On examination, the patient did not have any focal neurological deficit. Magnetic resonance imaging (MRI) brain revealed a mass lesion in the right temporo-parietal region, hypointense on T1 and hyperintense on T2 with ring enhancement on contrast administration. It was associated with perilesional edema and mass effect. 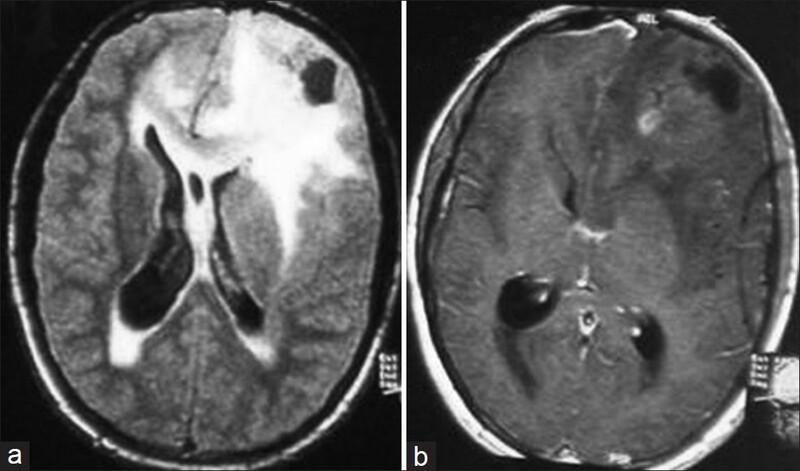 The radiological features were suggestive of high grade glioma [Figure 1]. The patient underwent right temporo-parietal craniotomy and gross total excision of the tumor. She had an uneventful peri-operative course and was discharged on 7 th post-operative day. Histopathological examination was suggestive of GCG. MIB-1 labeling index was 10%. The patient received post-operative radiotherapy and chemotherapy including temozolamide. She was well for 27 months before she was lost to follow-up. An 18-year-old male patient presented with focal seizure involving right upper limb since past 1 month and right-sided hemiparesis. Neurological examination revealed right-sided hemiparesis with a power of 4/5 (Medical Research Council grading). MRI brain revealed a mass lesion in the left frontal region; hypointense on T1, hyperintense on T2, and FLAIR images with inhomogenous post-contrast enhancement [Figure 2]. It was associated with perilesional edema and mass effect. The patient underwent left fronto-parietal craniotomy and gross total excision of tumor. He had an uneventful peri-operative course and was discharged on 7 th post-operative day. Histopathological examination was suggestive of GCG. MIB-1 labeling index was 25%. The patient received post-operative radiotherapy and chemotherapy including temozolamide. He was well for 30 months when he had a recurrence of tumor in frontoparietal region and died 1 month later. Histopathogical examination of both specimens revealed pleomorphic giant astrocytes with focal areas of necrosis. The neoplasic giant astrocytes were positive for glial fibrillary acid protein (GFAP). The MIB-1 labeling index was 10% in Case 1 and 25% in Case 2 [Figure 3]. Previously termed as monstrocellular tumor due to the macro size of its cells, the glial origin of these tumors has now been confirmed on electron microscopy and immunohistochemistry. , GCG, defined as glioblastoma with predominance of giant cells, is a rare subgroup and is often considered as a variant of GBM, classified as grade 4 tumor of WHO classification, although they might be considered as midway between grade 3 and grade 4 gliomas as they are prognostically better in terms of survival than the grade 4 GBM. GCG's don't differ much in the clinical presentation from the classical GBM, although the duration of symptoms may be short. From the imaging perspective, GCG has been described as a well-circumscribed lesion, possibly due to the fibrous stroma, although no distinguishing features can be found when compared to classic GBM. MRI usually reveals a contrast enhancing heterogeneous mass, with solid and cystic areas, hypo intense on T1 and hyper intense on T2 sequences with a surrounding edema. GCG is very rare in pediatric age group, but when diagnosis is confirmed, it offers better hope for such patients because they usually have a longer survival period than classic GBM patients. 1. Pollack IF. Current concepts: Brain tumors in children. N Engl J Med 1994;331:1500-7. 2. Palma L, Celli P, Maleci A, Di Lorenzo N, Cantore G. Malignant monstrocellular brain tumours: A study of 42 surgically treated cases. Acta Neurochir (Wien) 1989;97:17-25. 3. Hadfield MG, Silverberg SG. Light and electron microscopy of giant cell glioblastoma. Cancer 1972;30:989-96. 4. Kawano H, Kubota T, Sato K, Goya T, Arikawa S, Wakisaka S. Immunohistochemical study of giant cell in glioblastoma. Clin Neuropathol 1995;14:118-23. 5. Ohgaki H, Peraud A, Nakazatoy Y, Watanabe K, von Deimling A. Giant cell glioblastoma. In: Kleihues P, Cavenee WK, editors. Pathology and genetics of tumours of the nervous system. Lyon: IARC 2000. p. 40-1. 6. Kroh H, Matyja E, Marchel A, Bojarski P. Heavily lipidised, calcified giant cell glioblastoma in a 8 year old patient associated with neurofibromatosis type 1: Report a case with long term survival. Clin Neuropathol 2004;23:286-91. 7. Al Saleem T, Wessner LL, Scheithauer BW, Patterson K, Roach ES, Dreyer SJ, et al. Malignant tumours of the kidney, brain and soft tissues in children and young adults with the tuberous sclerosis complex. Cancer 1998;83:2208-16. 8. Mc Keever PE, Chronwall BM, Houff SA, Sever JL, Kornblith PL, Padgett BL, et al. Glial and divergent cells in primate central nervous tumours induced by JC virus isolated from human progressive multifocal leukoencephalopathy. Prog Clin Biol Res 1983;105:239-51. 9. De Prada I, Cordobes F, Azorin D, Contra T, Colmenero I, Glez-Mediero I. Paediatric giant cell glioblastoma: A case report and review of the literature. Childs Nerv Syst 2006;22:285-9. 10. Margetts JC, Kalyan-Raman UP. 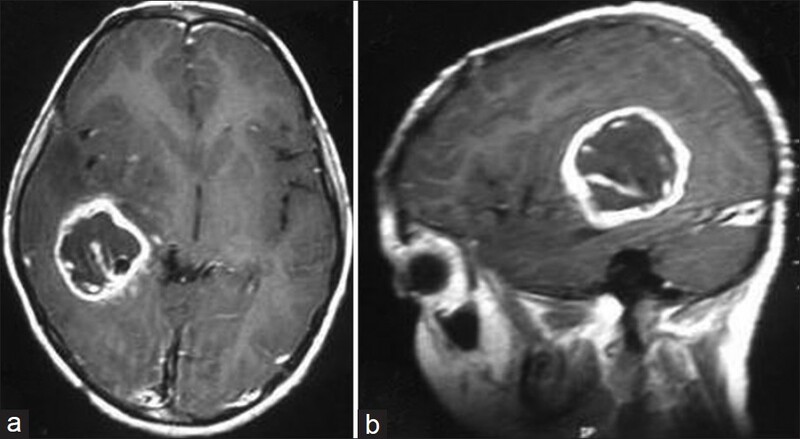 Giant celled glioblastoma of brain: A clinico- pathological and radiological study of ten cases (including immunohistochemistry and ultrastructure). Cancer 1989;63:524-31. 11. Parekh HC, Sharma RR, Prabhu SS, Keogh AJ, Lynch PJ. Multifocal giant cell glioblastoma: A case report. Surg Neurol 1993;40:151-4. 12. Klein R, Molenkamp G, Sorensen N, Roggendorf W. Favourable outcome of a giant cell glioblastoma in a child. Report of a 11 year survival period. Childs Nerv Syst 1998;14:288-91. 13. Akslen LA, Mork SJ, Larsen JL, Myrseth E. Giant cell glioblastoma: A work up of 2 cases with long survival. Acta Neurol Scand 1988;79:194-9. 14. 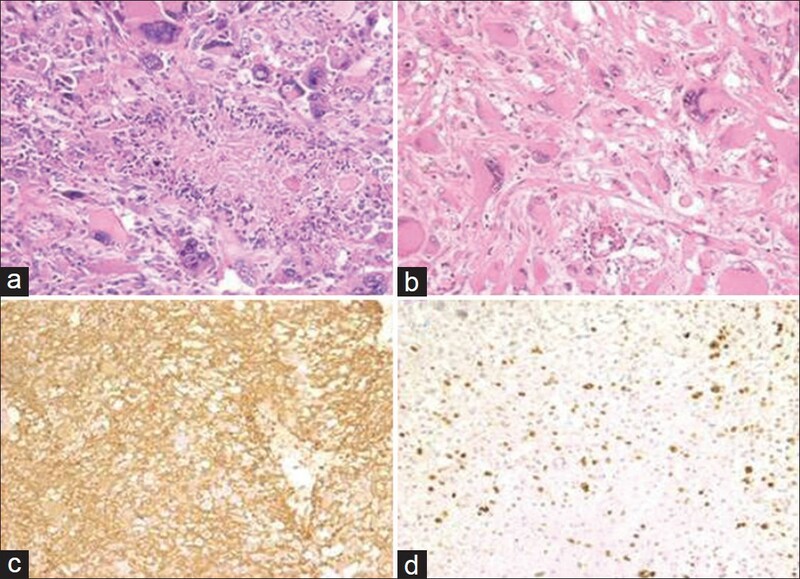 Deb P, Sharma MC, Chander B, Mahapatra AK, Sarkar C. Giant cell glioblastoma multiforme: Report of a case with prolonged survival and transformation to gliosarcoma. Childs Nerv Syst 2006;22:314-9. 15. Katoh M, Aida T, Sugimoto S, Suwamura Y, Abe H, Isu T, et al. Immunohistochemical analysis of giant cell glioblastoma. Pathol Int 1995;45:275-82. 16. Meyer-Puttlitz B, Hayashi Y, Waha A, Rollbrocker B, Boström J, Wiestler OD, et al. Molecular genetic analysis of giant cell glioblastomas. Am J Pathol 1997;151:853-7. 17. Martinez-Diaz H, Kleinschimdt-Demasters BK, Powel SZ, Yachnis AT. Giant cell glioblastoma and pleomorphic xanthoastrocytoma show different immunohistochemical profiles for neuronal antigens and p53 but show reactivity for class III beta- tubulin. Arch Pathol Lab Med 2003;127:1187-91. 18. Giannini C, Scheithauer B, Burger C, Brat DJ, Wollan PC, Lach B, et al. Pleomorphic xanthoastrocytoma: What do we really know about it? Cancer 1999;85:2033-45.